If you're looking for an outfit that’s fashionable and flattering, why not try a saree? Refresh your ethnic wardrobe by investing in a few sarees on a budget. The old-school saree shops in Pune are where you'll find something traditional and affordable, for sure. Located on Laxmi Road, this store has a wide variety of good quality sarees of many styles and prints. Semi silk, printed, chiffon and georgette are only some of the sarees offered at this store. You'll find a variety of hues, designs and details on the sarees. And some have gorgeous borders, worth flaunting. A range of styles and great prices starting at INR 800. At Ganpati Sarees, Italian Crepe, as well as simpler styles, are offered at this store. But, we guarantee you'll find a sari for any occasion. Drop in by noon and you'll surely get maximum attention and space to be able to see saree after saree, till you pick something you love. Get your gorgeous cotton saris here starting at INR 300. 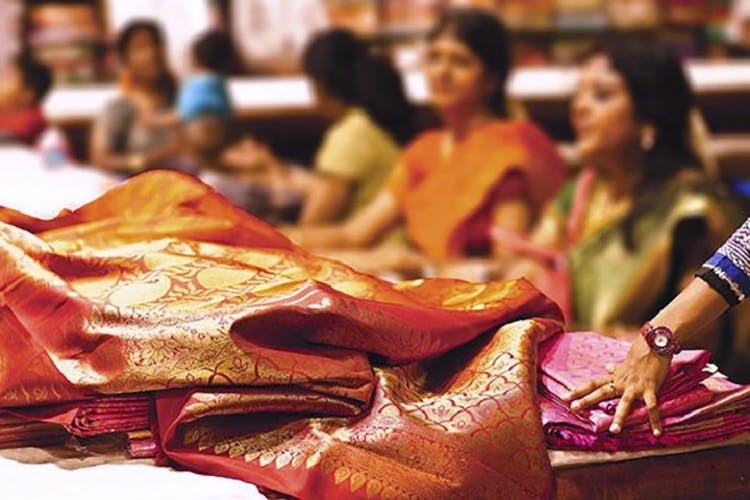 For under INR 500, this Sadashiv Peth store has got all your budget sari needs covered. With synthetic blends and many trendy styles available, Peshwai Creation is your average saree store offering a range that's budget as well as luxurious. Why go to stores when Pune’s street shopping game is so strong? Find Saris for as little as INR 300 at the small stores on this iconic road. Find anything ranging from simple, cotton prints to more jazzy styles for special occasions. Test out your bargaining skills and score some funky, unique saris that you won’t find anywhere else. This Raviwar Peth store has cotton sarees starting at INR 300. Printed and chiffon ones are also available, but you may need to shell out a few more bucks. The store is ideally located, as the surrounding areas have many places to find blouse pieces and other accessories to match your sari (and nail your outfit).